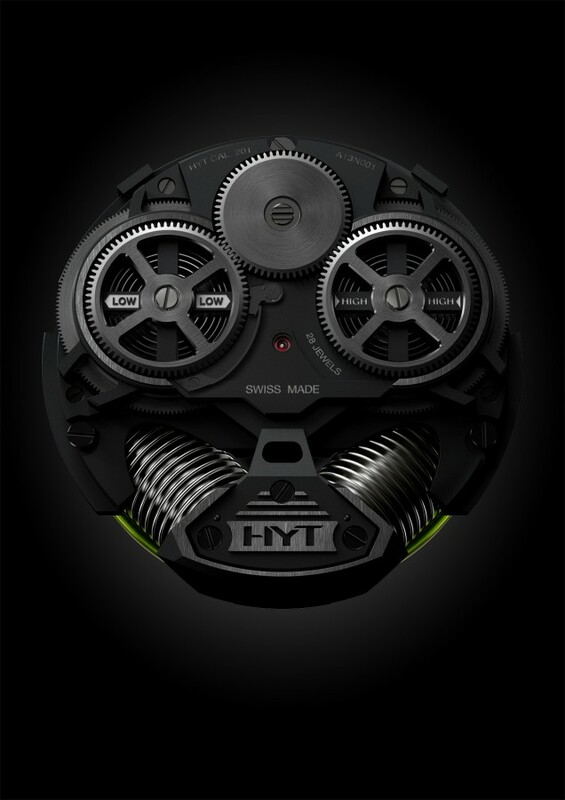 The H2 presents an evolution in HYT’s unique display of time, which we first saw in the 2012 H1. There is this scene in JRR Tolkien’s genre-defining tripartite novel The Lord of the Rings, when the heroes of Middle-Earth come together to discuss the insane idea of challenging Sauron before the gates of his armed-to-the-fangs stronghold in Mordor. Some wet blanket (because there’s always one at every committee meeting) suggests that the Dark Lord might see this more as a joke than an actual threat, but then Gandalf pretty sharply points out that there are those among their number whose names are “worth more than a thousand mail-clad knights apiece”. And by the end of the novel (spoiler: the good guys win), his words are shown to be true. While not exactly on the same level as laying siege to Barad-dûr, the concept behind HYT would sound relatively outlandish to anyone who wasn’t yet familiar with the people associated with it. Indicating time through columns of fluorescent liquid pumped back and forth by miniature bellows? 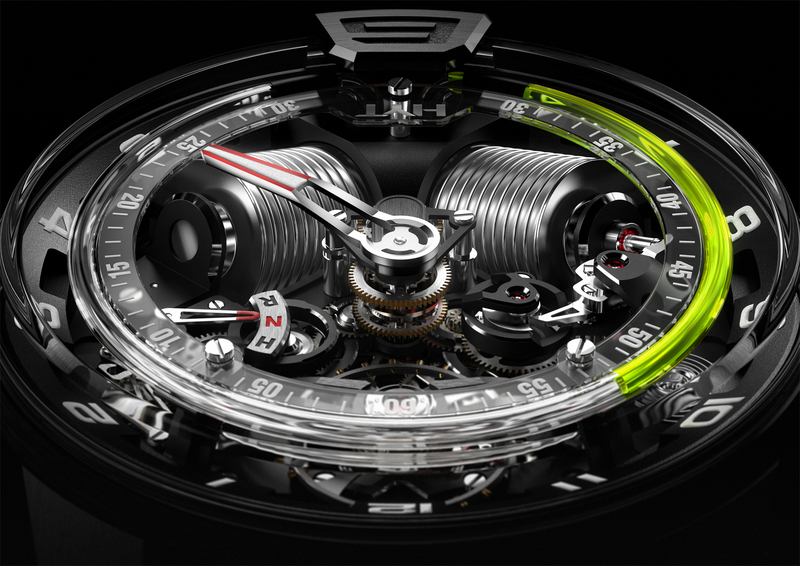 And yet, the names driving the company’s first product — the H1 — read like a who’s who of watchmaking past and present. 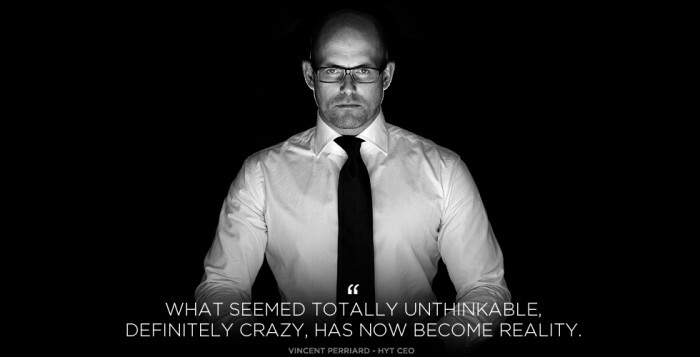 Vincent Perriard, CEO of HYT and well-known horological provocateur. 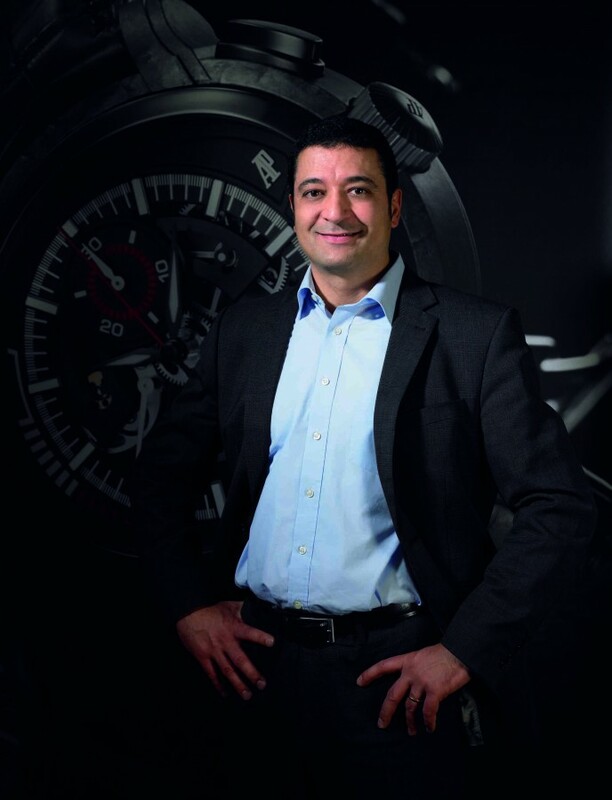 Jean-François Mojon, founder of Chronode, creator of IWC’s automatic base caliber 5000 and Harry Winston’s Opus X, and co-creator of MB&F’s Legacy Machine No. 1. And in a consultative capacity, Dr Ernst Thomke, the visionary who made the Swatch watch possible. Clearly, these are people who know when they’re onto something special. 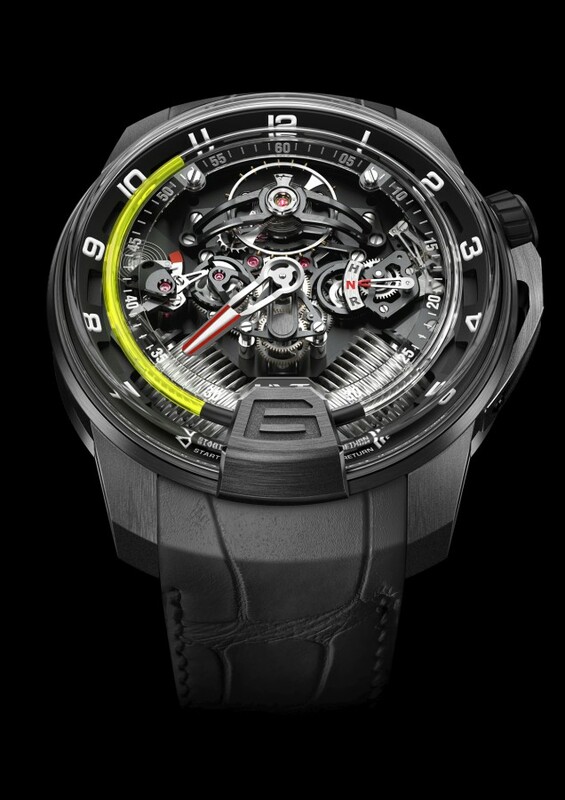 For their second watch, the unsurprisingly named H2, the HYT team have chosen to work with the experts at Audemars Piguet Renaud & Papi (APRP), the movement specialists with close to three decades of experience in creating unique interpretations of horology (think Chanel’s J12 Rétrograde Mystérieuse, the Audemars Piguet ChronAP, pretty much everything at Richard Mille). As with the H1, the H2 has its retrograde hours indicated by the meniscus between two columns of liquids — one fluorescent yellow and the other clear. 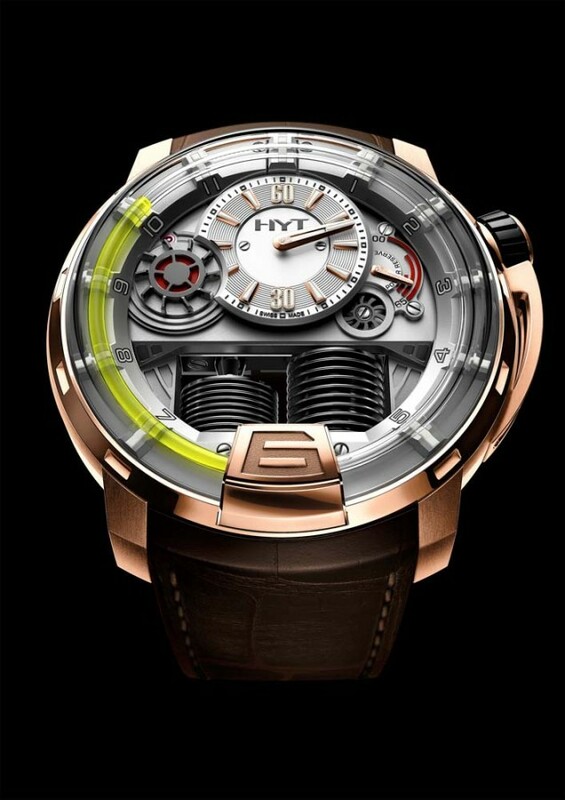 Minutes are indicated by a hand, although the H2 transposes the offset dial of the H1, bringing the minute hand to the center of the movement. 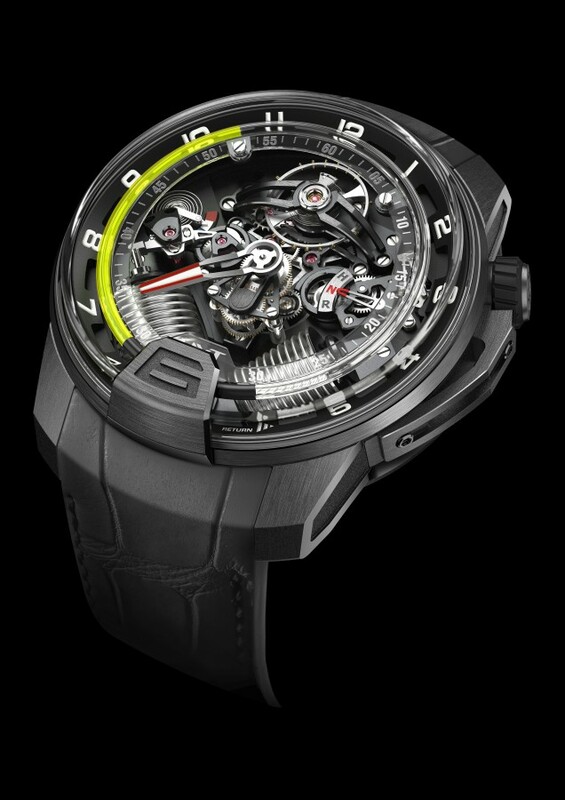 To accommodate the visual interruption at six o’clock, where the large hour index houses the fluid reservoir, the minute hand enacts a jump at the 30th minute of each hour. And because fluids tend to be extremely sensitive to changes in temperature, the H2 features a hand at nine o’clock to indicate when the watch is at optimum temperature for the display function. As the massed forces gather at the gates of Baselworld, look out for the H2 storming your shores soon.